It should really come as no surprise that the Prince of Darkness isn't all that into Christmas. 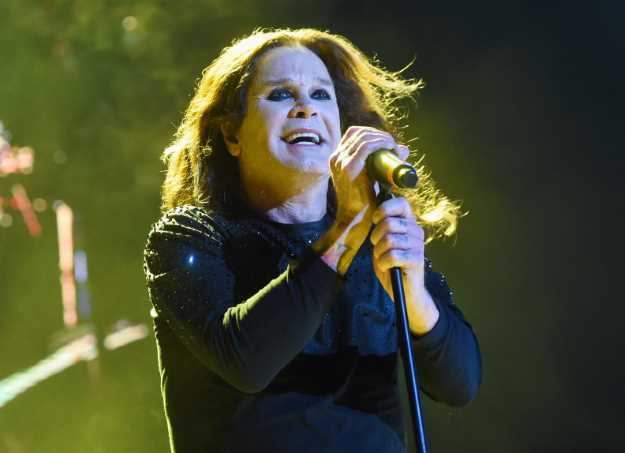 Ozzy Osbourne, who fronted the legendary metal band Black Sabbath, said he's not keen on all the surrounding hoopla. Bright, twinkling lights, holly jolly music, Rudolph and Santa Claus really don't mesh well with the black clothing, dark eyeliner and horror and war-themed lyrical content of Sabbath and Osbourne's extensive solo catalog. "I'd been telling Sharon for years I want to work through Christmas because I don't like it and it's a waste of time," the 70-year-old rocker said he told his wife, during a recent phone interview. While Osbourne may not give any cares about being near the top of Santa's naughty list, he does enjoy himself a good New Year's Eve event. The Osbournes, who reside in Los Angeles, typically spend it visiting relatives, having a cozy evening at home or heading out to a club to see a band perform. This year, however, they decided to throw their own party and invite all of their family and friends out for a special one-night-only New Year's Eve edition of their long-running festival tour, Ozzfest, at The Forum in Inglewood. The show will kick off at 2:30 p.m. with an outdoor party that will include sets by Zakk Sabbath, Devildriver and Wednesday 13 before the festivities move indoors at 6 p.m. where Ozzfest alumni Rob Zombie, Marilyn Manson, Jonathan Davis of Korn and Ozzfest newbies Body Count featuring Ice-T will take the stage. The evening will wrap up with Osbourne serving as the master of ceremonies and he is very much looking forward to being the guy who gets to yell "Happy New Year!" at midnight. "We're going in the day before to rehearse, work out the time and figure out which song I'll be doing so I can stop to ring it in," he said. "To be honest with you, I'm really looking forward to it. I think it will be a lot of fun. I prefer New Year's because it's one day, one night and then it's done! I hope people come and have a good time, that's what I'm about. I don't care if it's New Year's Eve or whatever, as long as people come and go 'Wow, that was a good way to bring in the New Year' or 'Wow that was really a great concert.'" Back in October, Osbourne was forced to cancel the last few U.S. dates of his No More Tears 2 Tour due to a nasty staph infection in his right hand. He said he was disappointed because he was looking forward to headlining the Hollywood Bowl in Los Angeles. He was, however, rescheduled the show, moving it to July 29, currently the final date of the lengthy global jaunt. "My right thumb, it had swollen up like a light bulb," Osbourne said. "Sharon said, 'Get in the car, we're going right now to the emergency room at Cedars-Sinai.' It just so happened, the guy who deals with infectious diseases was in his office and they put me straight into the hospital and did surgery on the spot to get all of the bad stuff out. I was baffled. It turned out I had three separate staph infections in the same area. I was in the hospital for three days on a drip, but it's totally gone now." Though the No More Tears 2 Tour has been billed as a "farewell tour," Osbourne said it has been a bit misleading as he has no plans on "retiring" from music, just easing up on the hectic tour schedule that would have him constantly traveling from country to country, state to state and not spending nearly enough downtime at home. Osbourne, along with guitarist Tony Iommi and bassist Geezer Butler, did officially retire Black Sabbath in 2017. For the No More Tears 2 Tour, he's been giving audiences one last massive dose of Osbroune before winding down, which has included sets filled with familiar hits like Sabbath's "War Pigs," "Paranoid," "Fairies Wear Boots" and his solo songs such as "Crazy Train," "No More Tears" and "Suicide Solution." "People have gotten that all wrong," he said. "The tour should have been the Ozzy Osbourne Slowing Down Tour. What I'm actually doing is not going out on Jan. 1 and coming back on Dec. 31. I'll still tour, but not as extensively like I have been for the last 50 years. I mean, I have grandchildren now and I'm 70 years old and I don't want to be found dead in a hotel room somewhere. I'm going to do it at a more leisurely pace and do some shows in Vegas ... but I'll never stop. The whole lifestyle I have lived, it has all come down to the fact that there are people who want to hear me and as long as they want to hear me, I'm there." Aside from being ready to rock in the New Year and finish out his No More Tears 2 Tour in 2019, Osbourne said he's having a blast filming "Ozzy and Jack's World Detour" with his son, Jack Osbourne for A&&E. The third season aired over the summer and the episodes follow Ozzy, Jack and sometimes even Ozzy's daughter Kelly Osborune as they travel the United States and really take in all of the sights the country has to offer. "America has some (really) beautiful places and when we're doing Jack's show, I can go into these places and nobody knows I'm there so I can walk around like a regular Joe with my boy," he said. "I get recognized from time to time, but it's not like when I'm on tour and people know I'm coming and I have paparazzi following me everywhere. It's great and I'm getting to know a side of my son that I never really knew existed." While Jack was taking time off from filming during the third season as his wife was giving birth to their third child, Minnie, Kelly was out on the road with Ozzy. He said he enjoys time with both of his children who are now in their 30s, though they still pick at each other like they're in grade school. "Jack and Kelly are always bickering," Osbourne said with a little laugh. "They always have and I guess they always will. What's wrong with you guys? You're in your 30s. Is this ever going to stop? They've been that way since they were born. People say 'Oh well, it will be crazy for a few years and then it will mellow.' It's getting worse somehow in my house." Since he'll have more time on his hands next year, Osbourne said he has one room in his house that's completely his own where he'll retreat from the day-to-day madness to hang out and reflect. "I'll put on some music and doodle on some sketch pads and just drift away," he said. "I'm just enjoying life now to the fullest. I don't drink alcohol anymore. I don't smoke tobacco. I don't use drugs ... I'm doing good right now. I now think, how did I think going into a bar and getting (really) smashed and doing all that cocaine was (really) fun? I have come to think that if right now you had a gun, a bag of cocaine and a gallon of booze and you said 'Take your pick,' I'd pick up the gun. It's not worth it. I don't believe in making New Year's resolutions, so I won't be making one this year, I just hope that God keeps me alive."